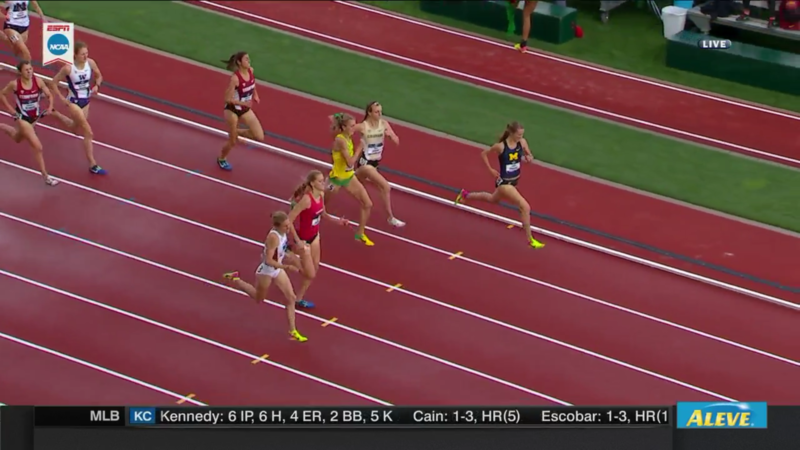 EUGENE, Ore. — The 2017 NCAA Outdoor Track & Field Women’s Championships are in the books and Oregon won in the most dramatic fashion possible. 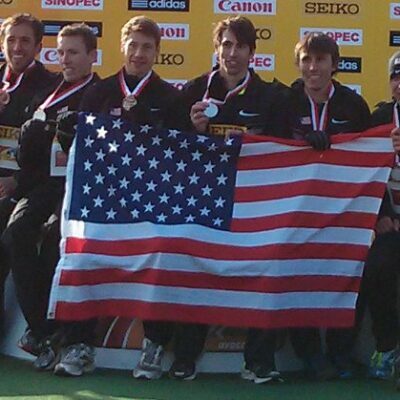 We recapped the team competition and the non-distance action in two separate articles. 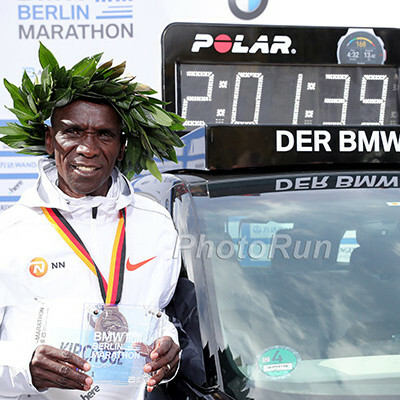 Below we have the coverage from the middle distance and distance races. 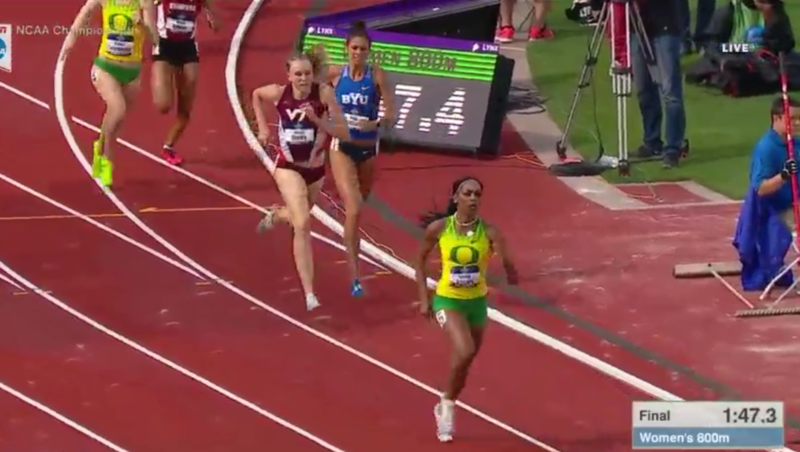 Raevyn Rogers of Oregon continued her dominance in the 800 getting an unprecedented third 800m outdoor title, Jaimie Phelan of Michigan got her first NCAA title in a thrilling 1500, as did Allie Ostrander of Boise State in the steeple, and Karissa Schweizer was dominant in the 5000m. We recap those races below. 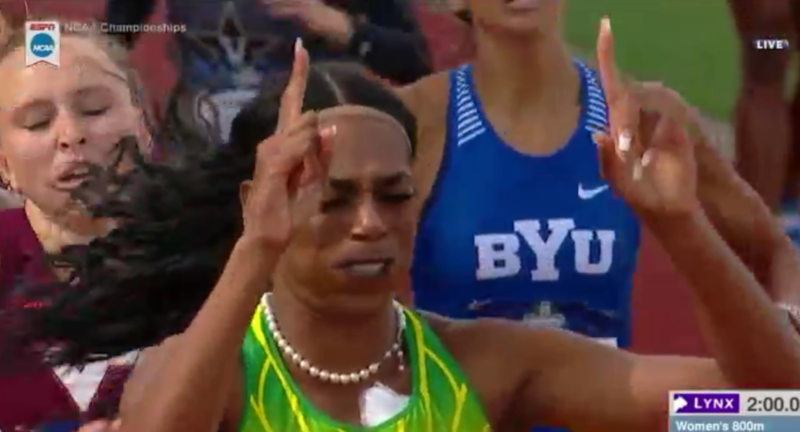 Oregon junior Raevyn Rogers made history this evening as she won her third straight NCAA 800 title in dominant fashion. 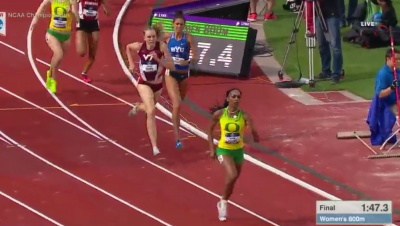 Rogers was way better than everyone else over the final 100 and won in 2:00.02, 1.30 seconds ahead of the runner-up, Virginia Tech’s Hanna Green (2:01.32), who finished 2nd behind Rogers at an NCAAs for the third time in her career. Rogers’ teammate Brooke Feldmeier was third as BYU senior Shea Collinsworth, who gave Rogers a spirited fight during the first 700 meters, faded to fourth (2:02.30). 2016 NCAA runner-up Olivia Baker of Stanford was last (2:04.21). The race was very fast at the start as Collinsworth, Rogers and Green all battled for the lead at 200 with Collinsworth getting it in 27.1. At 400, Collinsworth and Rogers (58.33 and 58.44) were running shoulder to shoulder. After battling with Collinsworth for most of the race, Rogers finally got the lead on the backstretch. Coming off the final turn, Rogers started to separate and the rest was history. Raevyn Rogers is the first three-time NCAA 800 outdoor champ in history. Prior to today, five women had won two 800 titles in the women’s competition, which dates to 1982. Three titles in the same event – no matter what event – is rare. Coming into today’s competition, 21 women had won the same NCAA event three times at NCAA outdoors – not counting the four women who have won the same event four times. If she doesn’t go pro, Rogers will certainly be looking to be the fifth woman to be a four-time winner of the same event along with Georgia’s Keturah Orji, who won a third straight title tonight in the triple jump. Counting indoors, Rogers has now won five NCAA individual titles. Her margins of victory are as follows. This meet was supposed to be a laugher for the Ducks, but after several missteps, they needed Rogers to be at her absolute best on Saturday and she was, crushing the competition in the 800 before splitting a ridiculous 49.77 to anchor the 4×400 to victory. Rogers has now won five straight NCAA 800 titles between indoors and outdoors and, as the stat above shows, hasn’t been challenged in any of them. Plus she’s got a 4×400 crown and a team title to go with them. And she’s the collegiate record holder in the event. With that in mind, we asked her if there is anything left for her to accomplish at the NCAA level. “I don’t know, we’ll have to see,” Rogers said coyly, breaking into a smile. We have no inside information, but we’d be shocked if Rogers returns for her senior year in Eugene. She’s clearly a cut above the rest of the NCAA in the 800 and though coach Robert Johnson would love to have her back — he noted that she doesn’t hold the NCAA indoor record — she’s not going to gain much by crushing everyone in the NCAA for another year. Watch her answers beginning at the 2:41 mark and tell us that’s not the look of an athlete about to ink a pro contract. As for the 4×400, Rogers said Ellis’ inside pass caught her by surprise but she stayed calm and remained patient. Green was by no means a star in high school with a 2:16 PR, but she graduates Virginia Tech with an outstanding college career as she was a three-time NCAA runner-up — all three times behind an all-time collegiate great in Rogers. 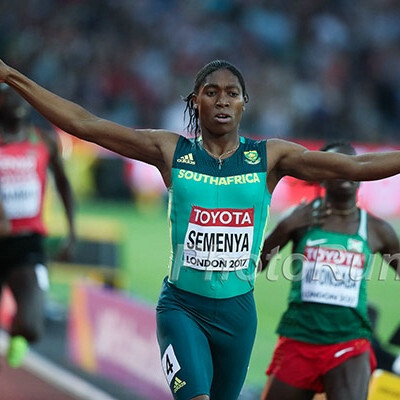 Green said that the biggest key to her improvement has been training as a distance runner in college (in high school she trained more like a sprinter). Indeed, she made a big breakthrough in the 1500 this year, lowering her PR from 4:23 to 4:15 to win the ACC meet and Green thinks that added endurance has helped her maintain her speed in the 800. Now Green will try to make it as a pro and chase her next goal: sub-2:00. Feldmeier wasn’t projected to score any points in Track & Field News’ form chart, but she defied all expectations by making the final and finishing third. Obviously you can point to any event and say that the meet would have gone differently had so-and-so not scored, but Feldmeier’s surprising run was certainly one of the keys to the Ducks’ victory. It wasn’t as much of a surprise to Feldmeier, however. “I put no limits on myself coming in and just go out there and see what I can do,” Feldmeier said. Coach Johnson and Feldmeier both said Feldmeier had been showing glimpses of greatness in practice but not quite putting it together in races. That changed today. Shea Collinsworth has now finished 4th, 3rd, and 3rd to Raevyn Rogers at the last three NCAA champs. We asked her if she liked facing the NCAA’s best 800m runner ever and Shea said her mother asked her the same question. Shea said she likes facing the best. Olivia Baker of Stanford finished last in the 800 after getting 2nd last year. She was disappointed with the run and said she got a little carried away early as she liked a more even pace. 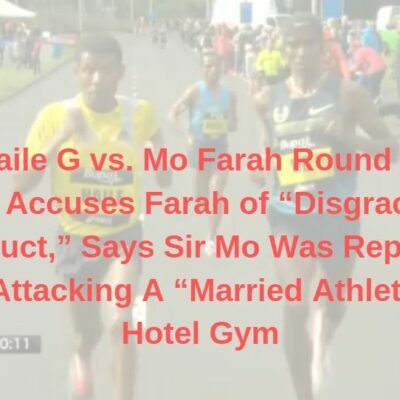 She also said that before her prelim she started feeling sick and checked the label on the rotisserie chicken she bought. To her horror, it said it wasn’t fully cooked and needed to be cooked more. She vomited after her prelim and felt it didn’t affect her today two days later, but if we had to bet, we’d bet it did. Coaches will tell you that positioning is critical to success in 1500s unless they are rabbitted. Don’t tell that to Michigan junior Jaimie Phelan. Phelan, the Big 10 champion, went from last to first on the last lap to win a wild women’s 1500 in dramatic style thanks to a 61.62 final lap. 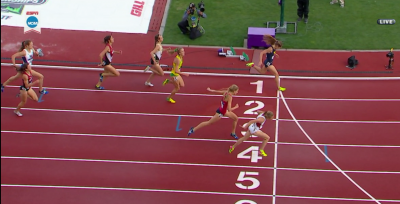 With 30 meters left, there were five runners abreast gunning for the title but in the end Phelan was the winner by .02 over SEC champ Nikki Hiltz (4:13.80) of Arkansas. At the finish, just .57 separated the top 5 as NCAA indoor mile champ Karisa Nelson of Samford was third (4:13.96), Oregon freshman Katie Rainsberger fourth (4:14.20) and Colorado’s Dani Jones, the indoor 3000 and DMR champ, fifth in 4:14.35. Given the fact that up until the bell, this race had been consistently run at a 69-second-per-lap pace, the field was extremely closely bunched at the bell as just .68 of a second separated first from last. At the bell, it was the indoor champ Nelson who led. She had the lead until the backstretch when Phelan, who had run the first 2.75 laps in next to last or last, made a big move to grab the lead. Can Phelan become just the third winner to repeat in 2018? In this evening’s final, 10 of the 12 competitors were non-seniors so we did a little research into how many people repeat as NCAA 1500 champ. It happens very rarely. Only two women in the history of NCAA women’s track, which dates to 1982, have won more than one NCAA 1500 title. Suzy Favor won four titles in a row from 1987 to 1990 and Tiffany McWilliams won two in a row in 2003 and 2004. Phelan, a redshirt junior, will have a shot in 2018. Phelan said she wasn’t too worried about being in last at the bell because the field was so close together. Phelan won her title today by the tiniest of margins. At NCAA cross in the fall, Phelan was edged at the line by Maggie Schmaedick of Oregon, and that was the margin for the Ducks to beat Michigan for the team title by one point. Phelan was asked if this gave her some extra redemption. She said her thought at the end of today’s race was the exact same as in cross country: get to the line. She also noted Michigan wasn’t expected to finish second at NCAA cross. 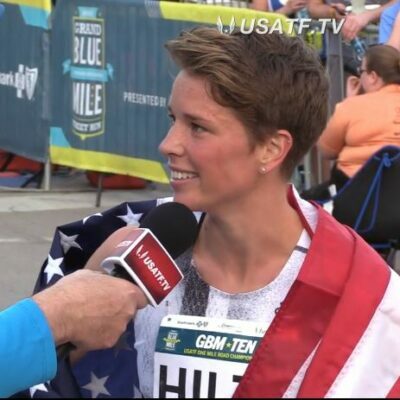 Hiltz didn’t know if she was first or second when she crossed the line and had to look at the scoreboard to receive the news, which unfortunately had her in second place. During the stretch drive, as she was driving toward the line, Hiltz’ mind wandered to an interesting place: her teammates in the heptathlon, who would soon be running the 800 meters. “I was just like, ‘Hurt for them, because I know they’re hurting for me right now.’ Just a teammate thing,” Hiltz said. Though Hiltz admitted that she was disappointed not to earn the victory, today’s run marked the culmination of a breakout junior year. Her fastest 1500 last year was just 4:20; she finished 8th at SECs and was eliminated in the first round at regionals. This spring, she ran 4:10, won SECs and came .02 shy of winning NCAAs. Not bad at all. Nelson, the NCAA champ indoors, obviously wanted to win, but she was pleased with her effort, a marked improvement from last year when she felt she gave up in her semi. She said in retrospect, she perhaps should have waited longer to take the lead rather than grabbing it at the bell, but she was in with a shot to win with 30 meters remaining and you can’t ask for much more than that. One thing that became evident about Nelson: she gets in the zone (or zones out?) during races. She was asked afterwards about Phelan and initially didn’t know who Phelan was (we can’t totally blame her as Phelan’s win was a big surprise) and then couldn’t remember anything about her winning move. With an NCAA title indoors and a 4:10.91 PR outdoors, 2017 has been a breakout year for Nelson, and she hopes it continues at her first U.S. championship. She knows that meet will be a challenge but is hoping she can break 4:10 as it’s the next natural barrier for her to break. During a close race, the middle of the pack can be a tough spot to be as you have to expend energy to defend your position but your position still isn’t that great. That was the case for Jones during the middle of this race, and though she eventually found daylight on the final lap, she didn’t have the same kick as she did at NCAA indoors — perhaps because she spent those races at the back of the pack as opposed to the middle. Boise State redshirt freshman Allie Ostrander, who missed an entire year of NCAA competition due to injury, returned to the NCAA Championships in style as she won the women’s steeplechase in 9:41.31, her second PB in the span of three days. Ostrander came into NCAAs with a 9:55.61 pb, ran 9:50.55 in the semis and now sports a 9:41.31 which means she has the World Championship standard (9:42.00). 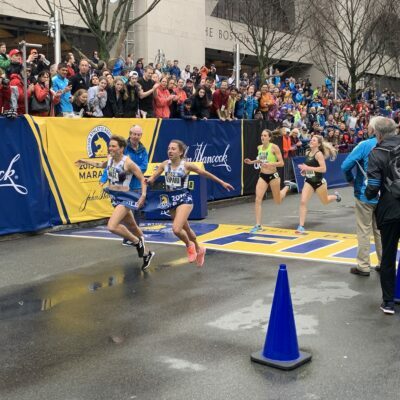 Ostrander was up front throughout, sitting in first or second every time the runners came by the finish line, but at the bell she was in second behind NCAA leader Elinor Purrier of New Hampshire. The last lap was no contest, however, as Ostrander ran a 71.89 as Purrier, who was still in second with 100 to go, faded and only managed a 78.94, which resulted in her finishing 4th (9:49.26). The runner-up was Colorado true freshman Madison Boreman (9:46.48) as Penn State senior Tori Gerlach finished third (9:46.76) and had the best last lap of anyone in the field (71.17). Since Ostrander is only a redshirt freshman, the question now becomes how many NCAA titles will she win before he career is over? In the 17 years of the women’s steeple, there have been only two women who have won two titles – Jenny Barringer (2006, 2008 and 2009) and Emma Coburn (2011 and 2013), both of Colorado. It’s rare for an athlete to become an NCAA champion in their first year in an event, but it’s also rare for an athlete to be as talented as Allie Ostrander. She was second at NCAA XC as a true freshman in 2015 and ran 15:24 as a 19-year-old to make the Olympic Trials final in 2016. Now she’s an NCAA champ and her celebration was one of the most emotional of the meet as she broke down in tears and crumpled to the track after crossing the finish line. The last year has been a challenging one, as after suffering a tibial stress fracture during the 2016 indoor season, Ostrander developed another one in her sacrum in September. She was very cautious in her recovery, taking the next three months off from running before following that with two months of walk-running. When she made her steeple debut at the Stanford Invite on March 31, running 9:55, she had only three workouts under her belt. Ostrander said that it was tough for her to sit idly by as her teammates were training and racing, but after dropping her mileage and intensity, her injuries are hopefully in the rearview mirror. “It was awesome today to just give stress fractures the middle finger and go out there and do it finally,” Ostrander said. 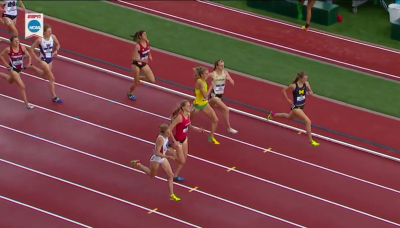 Boreman entered the meet with a 10:06 personal best and very conservative expectations — even after winning the Pac-12 title, she didn’t expect to make the NCAA final. Perhaps Boreman should have given herself more credit as she used a strong kick to finish second today in 9:46.48, her second PR in three days (she ran 9:51 in the prelims). 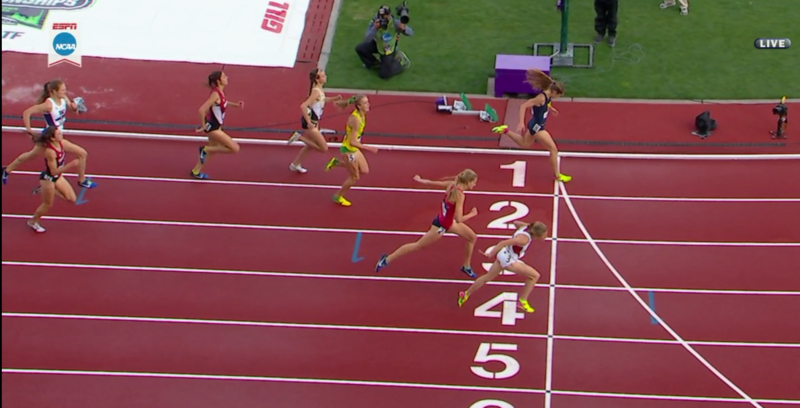 One thing about the women’s steeplechase is that championship races generally produce fast times. Unlike most distance races, in the steeple, leading isn’t really a disadvantage — actually, it’s probably an advantage as the leader gets to run the shortest distance and always has a clean run-up to each barrier. As a result, the best athletes generally get to the front early and force a fast pace. That was proven true once again today as the top three women all PR’d in both the semis and final in Eugene. Purrier ran to win and she paid for it the final 100m, but she was proud with her effort and gave credit to Ostrander. Missouri junior Karissa Schweizer, who used a big kick to come from behind to win last fall’s NCAA cross country championships in upset fashion, showcased a new tactic tonight as the favorite, but the results were the same – another NCAA title, her third of the school year. After an 8:05 first half, Schweizer blasted the second half of the women’s 5000 in 7:30 and won by a ton in 15:38.93. There was no need for Schweizer to take a victory lap as her last lap of the race tonight could have served that purpose as she had nearly a 10-second lead at the bell (9.80 seconds). With the win today, Schweizer became the fourth woman to win the NCAA cross country title and NCAA 5k titles indoors and out in the same academic year, joining Sally Kipyego (Texas Tech 2007-08) Amy Skieresz (Arizona 1996-97) and Jen Rhines (Villanova 1994-95). Behind Schweizer, there was a pack of 10 women within 1.59 seconds of each other at the bell, led by Oregon’s Samantha Nadel, who was trying to give the Ducks some breathing room in their quest for the team title. Her Oregon teammate Lilli Burdon was in sixth. When the lap was over, however, the Ducks would only end up getting one point as Nadel faded to 8th and Burdon was 9th. As a result, Oregon needed to win the 4 x 400 to win the team title and complete the triple crown and that’s what they would do. The clear winner of the battle for 2nd in the chase pack was Alsu Bogdanova of Eastern Michigan, who had by far the best lap of anyone in the race as she ran a 64.57 to move from 7th to 2nd (15:48.93) in a race where only one other racer closed under 67. Indiana sophomore Katherine Receveur was third (15:44.80) while steeplechase champ Allie Ostrander (15:46.18) was fourth to complete a remarkable double as the 5000 started less than an hour and a half after the steeplechase ended. Schweizer used her kick to win NCAA titles in cross country and indoors at 5,000 meters, but she lost the 3k indoors after waiting too long to make her move, losing to an even bigger kicker in Colorado’s Dani Jones. She wasn’t going to let that happen again today. Schweizer knew she was in killer shape coming into this race, and if she felt the pace wasn’t fast enough, her plan was to force the issue and burn off the pretenders by grinding the pace from a long way out. That’s what ended up happening as she grabbed the lead around the halfway mark and was quite clearly the class of the field. 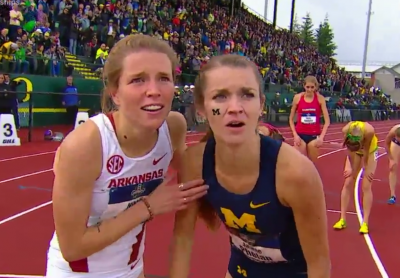 One year ago, Schweizer surprised everyone by taking third in this race, but after national titles in XC, indoors and outdoors, she’s now the best female distance runner in the NCAA. Schweizer still has another year to go, and the competition should be scared as she’s only getting better. She’s learning to win in different ways, and every victory gives her more confidence. “Going with 8 to go, I mean, I normally never do that and just having that confidence has really helped me,” Schweizer said. Full coverage in our 2017 NCAA Special Section.